The crowds swarming this year’s Intersolar North America at San Fransicso’s Moscone Center did an unusual thing. After combing the aisles and aisles hosting the photovoltaic (PV) and concentrating solar power (CSP) technologies’ booths, they wandered over to the two aisles dedicated to solar thermal and stayed to ask questions. What they found was lots of sophisticated versions of a solar technology that had its first U.S. patents filed in the 1890s. There are several modern kinds of solar collectors serving several purposes and different temperatures. Some are flat-plate collectors, some are evacuated tube collectors. Some have copper tubes that carry heating fluids like glycol. Some carry plain water. Some are in closed systems; some in open-loop systems. Some have plastic pipes. Some carry pumped water, and in some, the water follows gravity. Around the world, the industry is booming. 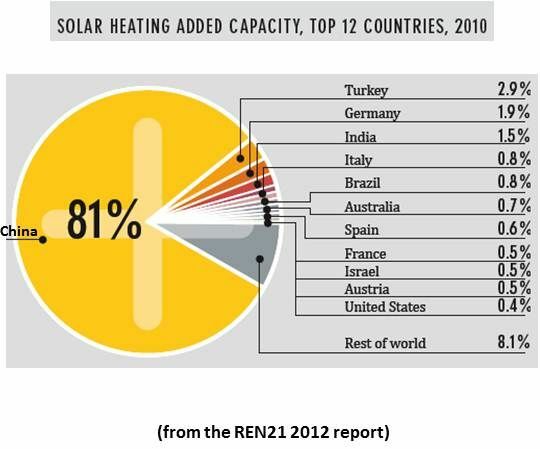 The global cumulative installed capacity in 2010, according to the most recent numbers from the Solar Electric Power Association (SEPA), was some 185 gigawatts-thermal. China led with 118 gigawatts-thermal installed. Multinational heating technologies specialist Baymak’s Deputy Export Manager Tacnur Yilmaz said her company, based in Istanbul, exports solar water heating (SWH) systems to more than 50 countries. She also said Turkey and its neighbor, Israel, compose eight percent of the world market. Yair Katz, Quality Assurance Manager for Israeli SWH system manufacturer Chromagen, explained that his fossil-fuel-poor country, in order to cut its electricity consumption, instituted a law in 1980 requiring SWH systems on all new residential buildings. As a result, Israel is the per capita global leader and has more systems installed than the U.S. The U.S. SWH industry is growing at 6 percent annually, according to recent SEPA statistics, but had only a 2.3 gigawatts-thermal installed capacity in 2010. The hands-down most cost-competitive SWH application, explained UMA Solar Regional Vice President Greg Gahagan, is pool heating. Piggybacking on the pool’s filtering system and primarily required for pool use during the months when the sun is hottest, no other energy source can match the sun for the pool heating task, Gahagan said. But, he added, echoing observations made recently to GTM by other SWH sector executives, it is not possible to compete with natural gas water heating systems at the current record low natural gas prices. Still, Sunnovations CEO Matt Carlson told GTM, there are some 100 million residential water heating systems in the U.S. and just under half use electricity, fuel oil or propane, so there is a competitive marketplace of roughly 50 million homes. “That’s a pretty sizeable market, and that’s where the opportunity is,” Carlson said. State incentives, like the California Solar Initiative (CSI) Solar Thermal program, could offset the impact of those low gas prices, Gahagan said. Effectively targeted incentives, Baymak’s Yilmaz agreed, have significantly helped solar thermal industries grow most everywhere else in the world. 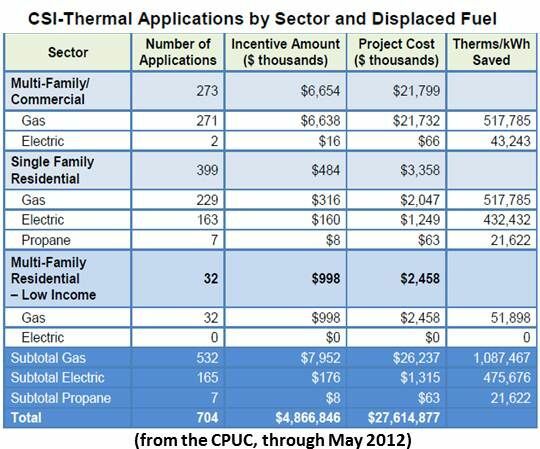 In just over two years, the California Public Utilities Commission (CPUC) recently reported about its solar thermal program, there have been 704 applications for solar thermal incentives worth $4.87 million. The $250 million CSI solar thermal program seems well on its way to displacing 585 million therms of natural gas use (about 200,000 solar thermal systems). Unless photovoltaic (PV) turns out to be a better deal. That is what as EDS USA CEO Ezra Mena believes his new Liberty Box will make happen. The Liberty Box, according to Mena, is wired between three or four rooftop PV panels and the lower heating element of a standard electric water heater. 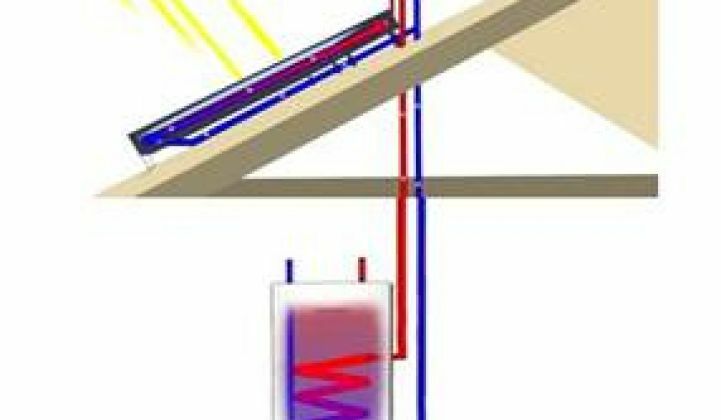 At an estimated installed total cost of perhaps $4,000, the system, which has yet to obtain final Underwriters Laboratory approval and come to market, supposedly enhances the delivery of PV electricity and thereby provides more hot water at a lower cost than conventional solar thermal systems. Mena, who recently left the Israeli Navy, touted a study from the City of Tallahassee, Florida, where EDS USA is based, that concluded the Liberty Box, which alone might sell for “under $1,000,” could provide 100 percent of a home’s hot water during the warmer months and 75 percent of it during the colder months. That betters conventional systems’ performances, Mena said. But, Chromagen’s Katz asked, why not just install a grid-connected PV system and use the electricity from the house without installing the box? Mena said the box is a more efficient, cost-effective solution. It also might be a way into PV for some consumers. Executives from Promise Energy said they have an even better way in. They have, they said, adequate financial backing to offer power purchase agreements (PPAs) on solar thermal systems. In this, they join a growing list of the strongest solar thermal providers (Sunnovations, Skyline Innovations, Holocene Energy). Third-party financing, which allows consumers to use solar without the costs or responsibilities of ownership, is a strategy that has taken PV to new levels. If third-party financing continues to be effective in the solar thermal sector, it could be something borrowed that takes U.S. solar water heating to the kind of success it has heretofore only had everywhere else in the world.